Butterflies are easy to make. The front one is coloured with red food dye which is close to skin colour. It has legs that grip your finger or any small perch. 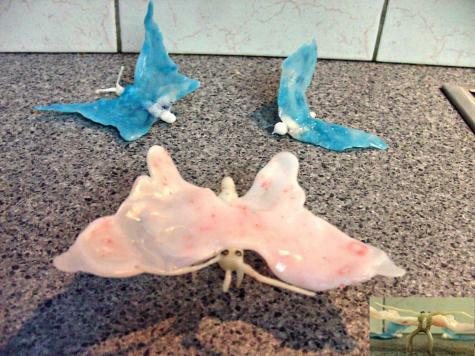 The two at the back, another butterfly and bluebird, are work in progress and coloured with blue food dye. Great stuff Brad, we especially like the clip-on leg design. Food colouring is a good way to give Plastimake a coloured tint, try alcohol based inks or acrylics when you need a stronger coloured result.